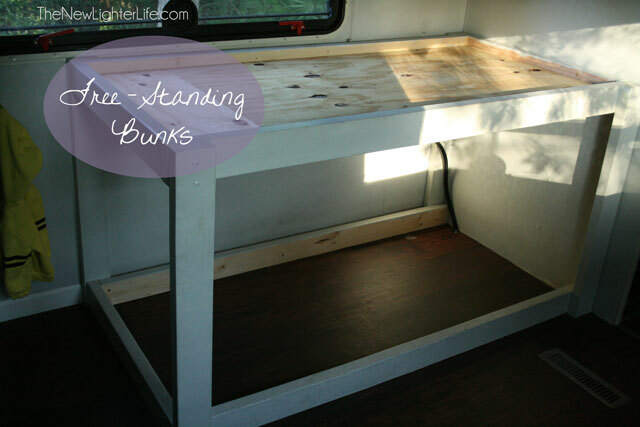 Today I’m going to show you how we accomplished our RV Bunk Remodel in our 96′ Winnebago. We had to do something when we downsized and sold our 5th Wheel. When we looked at our more frugal option of buying a Class A, we ran into a common problem. No bunks. Sure some Class A’s had bunks, but none that could accommodate 4 kids or that were in our price range. So what is a frugal family to do? Remodel. Our kid’s ages range from 8 years old down to 1 year old. With limited space in an RV, the best option we found was to change the master bedroom into a bunk room. Most master bedrooms have decent closets and ours was no exception. If you’re lucky, you’ll find one of the few RV’s that has a walk-in closet (look for the 2002 Monaco Signature Titan or 2000 Monaco Signature General). 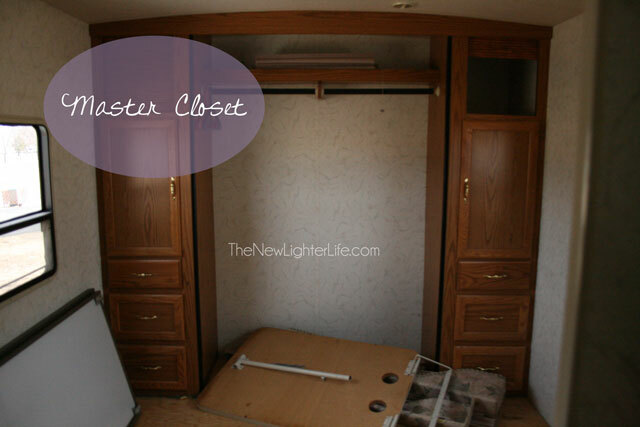 I’ve seen some RVers modify that walk-in closet to make a bunkroom. They look sweet and allow for the main living area to remain a main living area. Ours didnt have one. Meh…it still suits us well. Since we have 2 older kids (8 yo and 7 yo) and 2 younger kids (3 yo and 1 yo), we opted to take off the closet doors and put bunks in the open closet for the younger two. Here is the closet mid-remodel of the camper. 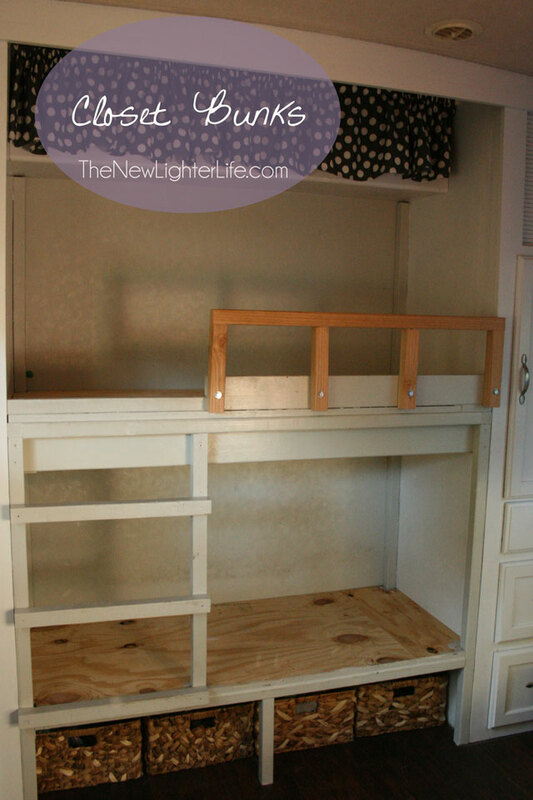 The closet area is a perfect length for our 2 little ones and measures 53″ long. I think we will get another couple years out of that area as bunks. If we ever decide we want to change the master back to a true master bedroom, we just need to put a pole for hanging clothes back in there and put the closet doors back on. The top shelf of the main closet area was left in and we use that to store blankets and diapers. I covered it with short curtain hung with a tension rod. Mark started out by placing 1X1’s around and framing the bed. These boards were screwed right into the back wall and cabinets. He also reinforced the bottom bunk to the floor. A 2X4 was attached to the front edge of the bed to build up a *box* to hold the mattress. Next he cut a piece of plywood to the shape of the bed to lay it into the box. We decided to raise up the lower bunk so we can store toys and clothes underneath in baskets. The above view is obviously without the cushions and the safety rail is still NOT painted. Chock that up to the fact that we are real people and living in it. Tip: Everything you remodel in an camper while living in it is 10 times harder than if you had done it before you moved in. Someday, we’ll do all the touch up painting and paint the rail. This is the area that the big kids bunks went. Since those kids are bigger, bigger bunks were needed. They also needed to be freestanding (but secured) because we didn’t want to put too much pressure and weight on the walls. Mark primarily used 2X4s and made them 61 inches long. I honestly don’t remember why we chose this weird length except that we were trying to cut costs and save space. We had to keep in mind the window that their bunk would be up against, the closet doors, and a functional walking path. These beds work for the kids. I’ve attempted to sleep on one (don’t laugh!!!!) and it’s obviously not long enough for a grown up but I think these will suit them for a few years. For mattresses, we purchased foam from Foam Factory. We explored all sorts of options for mattresses but Foam Factory was BY FAR the cheapest and best quality we could find. Since we have a laytex allergy in the house, we decided to go with regular foam that was super-stinky and off-gassed for a couple of weeks. In fact, after we purchased it, I was a little freaked that they would never stop smelling. 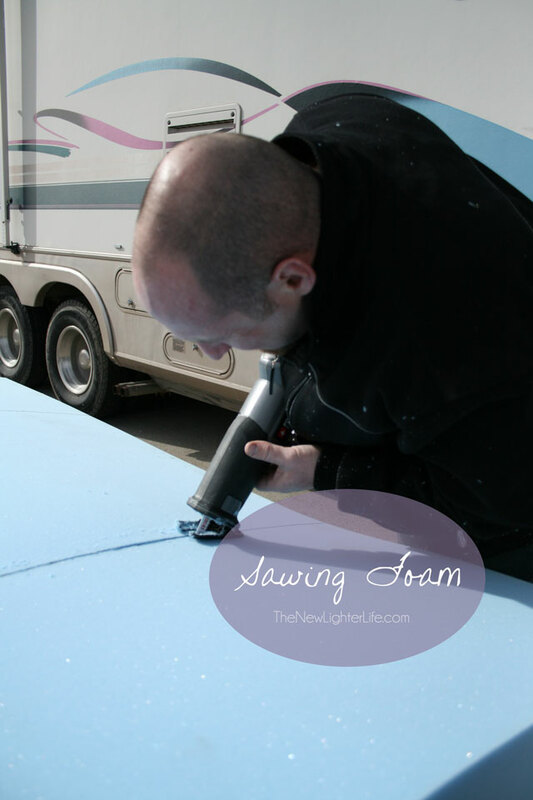 Mark took a reciprocating saw and cut the foam the correct dimensions. 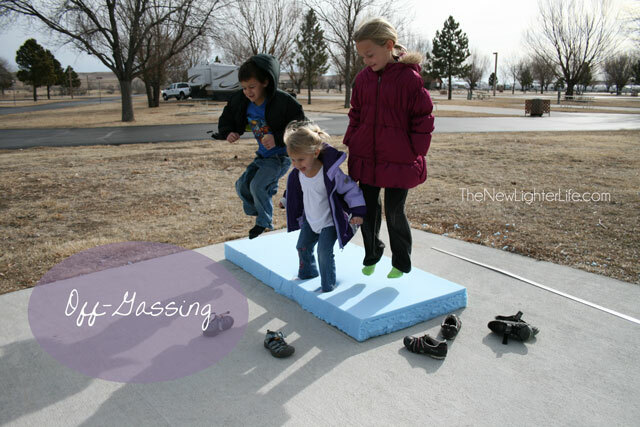 We enlisted the kids and had them jump up and down on them to force air in and out of the foam. I’m not sure if it helped or not, but they got some exercise and we had a laugh over it. Thankfully, it doesn’t smell anymore and we’ve had no adverse effects. We went with 3″ and 4″ foam and cut it to fit snugly. To fit our space, we had to one queen and one full size mattress. So What Will We Do when Our Kids Get Bigger? Upgrade our RV and go back onto a 5th wheel. Move kids to the main living area and make the master a master again. 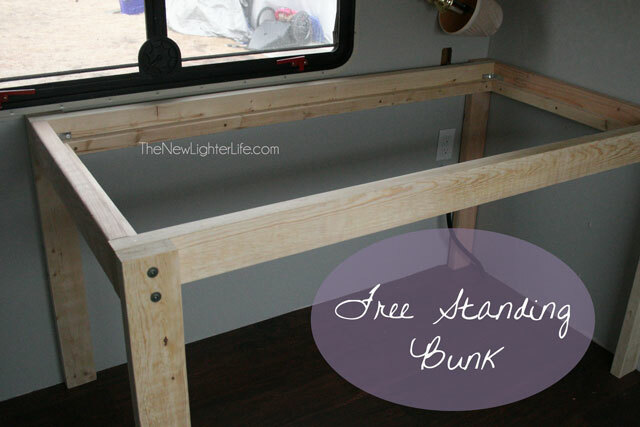 Tear out the closet bunks and build a 2nd freestanding bunk on the other wall. If we chose #3, we’d move their storage shelves into the closet so we could still have the toy/book storage cubes. Where do the We Sleep? We sleep in the main living area. Our bed came from Ikea and was the only option we found to fit a Queen bed in the camper main living space. It is a tri-fold bed called PS Havet. As I showed you previously, we have a raised slide. 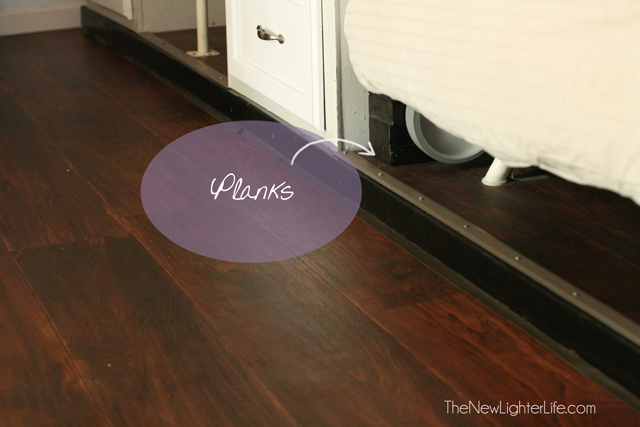 Since the sofa bed goes on top of the slide, Mark built a workaround to level out the floor by making planks. He screwed two 2X4’s together to get the correct height for the wheels of the bed to roll along and rest while the bed is out. When we’re ready to roll our bed out for the night, we place the wooden planks in front of the wheels. It works wonderfully. And the bed is comfy. So that is it for our master bedroom bunk modifications and main living queen bed. 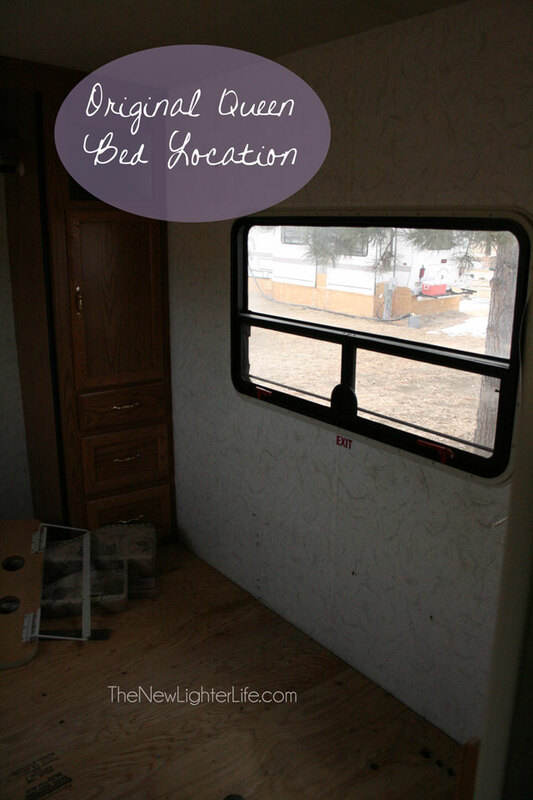 Hopefully these ideas help you figure out how best to configure your RV. I love that we were able to downgrade and make the space perfect for our family. This is neat! Any chance we can wee a full room shot of both bunk beds? Thank you Alida, but it’s pretty tough because I don’t have a wide-angle lens. I’ll see about getting a better shot up. what do you use as far as bed sheets go on the bunk size? We re-purposed their sheets and cut them down to size and sewed. I posted about it here, best wishes! Hi, I am going to ask this with as much tact as possible….how do you have your “alone mommy daddy time”???? We are getting ready to full time rv, in abut 4 months, but are still unsettled on our rv type due to budget and alone time! Thank you for your time! Well…ahem…we mangaged. 🙂 We always had a sound machine going at night so that the kids could sleep better. The kids had strict orders to stay in bed and we all got used to feeling like we were on a boat all the time so our time didn’t disturb anyone. How wide are the big kid bunks? And do the big kids find them wide enough? Also are they starting to grow out of them height wise? I’m thinking about doing something similar with the bathroom of my 19′ travel trailer and don’t have a lot of width to work with and am wondering how many years these mods will buy me. I’m sorry KC, if it’s not in this post, I can’t tell you. We sold our RV almost 1 1/2 years ago. Hi. My small family and I are considering uprooting from Nebraska and moving to Colorado. one thing we have considered is getting an RV and living in it full time. I’m still struggling with the idea of everyday life with a toddler (18 months) and such a small space and how to go about making it more suitable for all of us. Your blog and some others have definitely helped with figuring out a layout and storage solutions but how do you go through everyday routine especially with 4 kids and not just one? So glad it was helpful Abby! Yes, RV living is not without it’s challenges but it is doable! Best wishes to you on your adventures! I am looking for a Rv carpenter to come where we are parked and remodel my bunk house into setting room guest house we live in Florence Oregon owe can not move our 5th so we need some one to come to us our 5th is our home and it is set up like a home. I just need to know how I can find some one. Help.